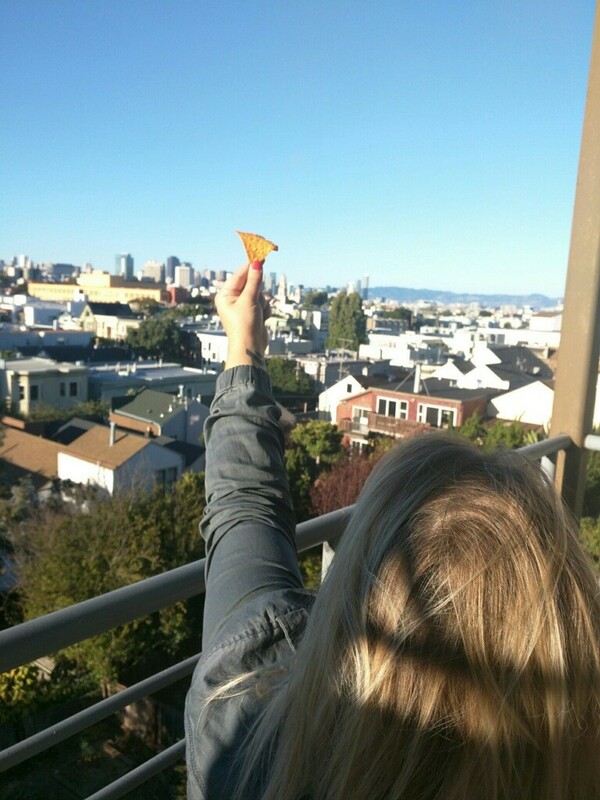 We all have our guilty pleasures, which is why junk food purveyors such as Frito-Lay release things like their latest concoction, the limited edition Doritos Roulette. The premise behind these chips, inasmuch as they have a premise at all, is that you never know when you’ll grab a spicy chip and end up with your mouth on fire, scrambling to find the closest carton of milk (or bag of milk, if you’re Canadian). They’re the shishito peppers of the junk food world. When I found out that these Doritos, normally so timid and harmless, sent a young British girl to the hospital I knew I had to try them for myself. Let me set the stage for this story — which is either the nadir or zenith of human experience, depending on your perspective — with the fact that I first learned to love spicy food at a Hooter’s in a tiny town in Switzerland. I may not be what you would consider a gourmand when it comes to spice, but I do appreciate a little heat. I understand that Doritos Roulette chips are a limited-edition commodity, but even so, it was ridiculously hard to find this goddamn snack. After asking parent company Frito-Lay for assistance on Twitter, it still took searching 10 stores to find them. If you run into the same problem, the Diamond Heights Walgreens is a good place to start. Buying these chips gave me the first indication of what eating them would be like. The Walgreens employees seemed genuinely stoked when they saw what I was purchasing.. They relayed their own experiences with Doritos Roulette, calling it “really fun,” which is not the first term I would think to use when describing chips. I have to imagine Walgreens workers sitting in the break room with the lights dimmed a la the Russian roulette scene in Deer Hunter, taking turns eating Doritos. But instead of dying, the losers are charged with eating expired yogurts. With the hard-to-find Doritos safely in my possession, I began my journey into judging their spiciness and viability as a proper junk food. Like actual roulette, it’s pretty sad to play alone, so my fiancé and my neighbor joined me. Even though the bag clearly warns snackers about the level of spiciness within, we dismissed it and stuck our hands in, ready to be disappointed (a feeling not uncommon when eating Doritos). That’s an endorsement if I’ve ever heard one. I was next to get a hot chip, and it was deliciously spicy! I can’t say it was so spicy that I felt a hospital trip was in order, but it certainly packed a punch. It progressed exactly as roulette is supposed to, and was certainly the most engaging experience I’ve ever had eating chips. Dare I say, it was fun, just as Walgreens said it would be, which made me question what constitutes fun just a little bit. Since nothing goes better with shame than alcohol, we washed down this snack with red wine. Unfortunately for Leaping Horse Vineyards, their cabernet sauvignon actually pairs extremely well with Doritos, the sweetness of the wine balancing out the spiciness of the chips. 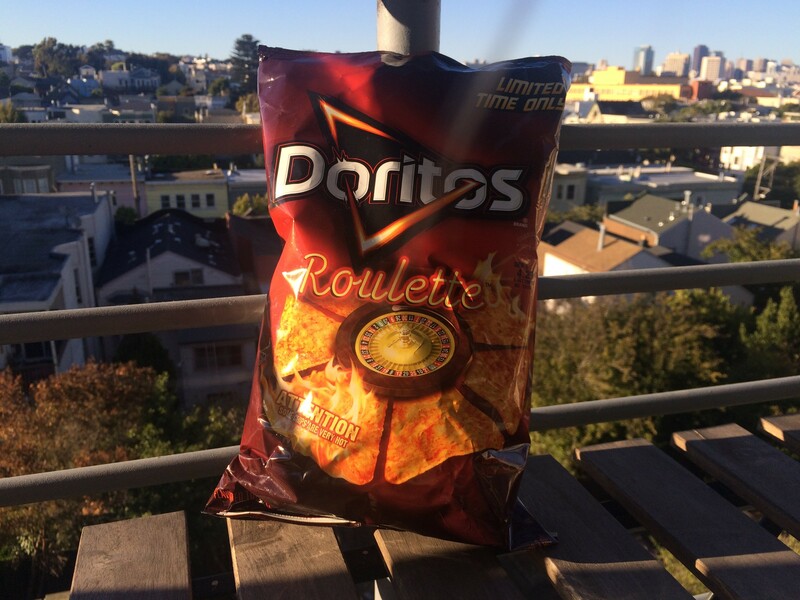 1500 calories later, we mutually agreed that Doritos should un-limited-edition the Roulette chips, or at the very least create a full-time spicy flavor. They taste great, make for a unique hanging-out experience, and the spiciness would tickle the tastebuds of even the most hardened spicy food eaters. Lastly, I want to share that we ate our Doritos with cottage cheese, a non-traditional dip but one I’ve enjoyed since childhood. Before you run away in disgust like I’m some kind of Republican, just try it. My neighbor was equally as skeptical, as I’m sure you all are, but like her, I bet you will be thanking me in the end.